Prevents problems with status in sunny weather. X A sweet aroma gently wafts from the leaf on its head. It is docile and loves to soak up sun rays. X Ein süßer Duft geht von dem Blatt auf seinem Kopf aus. Es ist ruhig und liegt gerne in der Sonne. X Un doux parfum émane de la feuille placée sur sa tête. Il est très gentil et aime dormir au soleil. X Un dulce aroma se desprende de la hoja de su cabeza. Es dócil y le encanta absorber los rayos de sol. X Un dolce profumo si diffonde dalla sua testa. È docile e ama scaldarsi al sole. X 머리의 잎사귀에서 살짝 달콤한 향기가 감돈다. 얌전하며 햇볕을 쬐는 것을 매우 좋아한다. Y It uses the leaf on its head to determine the temperature and humidity. It loves to sunbathe. Y Mit dem Blatt auf seinem Kopf bestimmt es die Temperatur und Feuchtigkeit. Es liebt Sonnenbäder. Y Il jauge la température et l’humidité grâce à la feuille sur sa tête. Il raffole des bains de soleil. Y Con la hoja de su cabeza puede medir la temperatura y la humedad. Le encanta tomar el sol. Y Usa la foglia sulla sua testa per misurare la temperatura e l’umidità. Ama crogiolarsi al sole. Y 머리의 잎사귀로 주위의 온도나 습도를 살핀다. 햇볕을 쬐는 것을 매우 좋아한다. 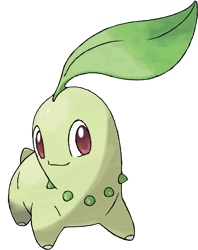 Omega Ruby In battle, Chikorita waves its leaf around to keep the foe at bay. However, a sweet fragrance also wafts from the leaf, becalming the battling Pokémon and creating a cozy, friendly atmosphere all around. Omega Ruby Im Kampf wedelt Endivie mit seinem Blatt, um den Feind fernzuhalten. Von dem Blatt geht auch ein süßlicher Duft aus, der das gegnerische Pokémon im Kampf beruhigt und eine gemütliche, freundliche Atmosphäre schafft. Omega Ruby Lorsqu’il se bat, Germignon secoue sa feuille pour tenir son ennemi à distance. Un doux parfum s’en dégage également, apaisant les Pokémon qui se battent et créant une atmosphère agréable et amicale. Omega Ruby Al luchar, Chikorita agita la hoja que tiene para mantener a raya al rival. Pero, al mismo tiempo, libera una suave fragancia que apacigua el encuentro y crea un ambiente agradable y de amistad. 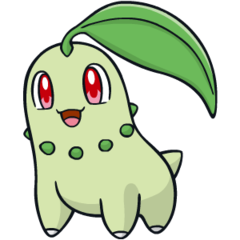 Omega Ruby Nella lotta, Chikorita sventola la sua foglia in modo da tenere a bada il nemico. Tuttavia, la foglia emana anche un aroma dolce, che calma il Pokémon avversario, creando un’atmosfera gradevole e rilassata tutt’attorno. Omega Ruby 잎사귀를 휘둘러 상대를 위협하지만 잎사귀에서 달콤한 향기가 풍겨 나와 서로 온화한 분위기가 된다. Alpha Sapphire In battle, Chikorita waves its leaf around to keep the foe at bay. However, a sweet fragrance also wafts from the leaf, becalming the battling Pokémon and creating a cozy, friendly atmosphere all around. Alpha Sapphire Im Kampf wedelt Endivie mit seinem Blatt, um den Feind fernzuhalten. Von dem Blatt geht auch ein süßlicher Duft aus, der die kämpfenden Pokémon beruhigt und eine gemütliche, freundliche Atmosphäre schafft. Alpha Sapphire Lorsqu’il se bat, Germignon secoue sa feuille pour tenir son ennemi à distance. Un doux parfum s’en dégage également, apaisant les Pokémon qui se battent et créant une atmosphère agréable et amicale. Alpha Sapphire Al luchar, Chikorita agita la hoja que tiene para mantener a raya al rival. Pero, al mismo tiempo, libera una suave fragancia que apacigua el encuentro y crea un ambiente agradable y de amistad. Alpha Sapphire Nella lotta, Chikorita sventola la sua foglia in modo da tenere a bada il nemico. Tuttavia, la foglia emana anche un aroma dolce, che calma il Pokémon avversario, creando un’atmosfera gradevole e rilassata tutt’attorno. Alpha Sapphire 잎사귀를 휘둘러 상대를 위협하지만 잎사귀에서 달콤한 향기가 풍겨 나와 서로 온화한 분위기가 된다. Gold A sweet aroma gently wafts from the leaf on its head. It is docile and loves to soak up the sun's rays. Silver Its pleasantly aromatic leaves have the ability to check humidity the and temperature. Stadium2 A sweet aroma gently wafts from the leaf on its head. It is docile and loves to soak up the sun's rays. Ruby In battle, Chikorita waves its leaf around to keep the foe at bay. However, a sweet fragrence also wafts from the leaf, becalming the battling Pokemon and creating a cozy, friendly atmosphere all around. Sapphire In battle, CHIKORITA waves its leaf around to keep the foe at bay. However, a sweet fragrance also wafts from the leaf, becalming the battling POKeMON and creating a cozy, friendly atmosphere all around. FireRed Its pleasantly aromatic leaves have the ability to check the humidity and temperature. LeafGreen A sweet aroma gently wafts from the leaf on its head. It is docile and loves to soak up the sun's rays. Emerald It waves its leaf around to keep foes at bay. However, a sweet fragrance also wafts from the leaf, creating a friendly atmosphere that becalms the battlers. Diamond It uses the leaf on its head to determine the temperature and humidity. It loves to sunbathe. Pearl It uses the leaf on its head to determine the temperature and humidity. It loves to sunbathe. Platinum It uses the leaf on its head to determine the temperature and humidity. It loves to sunbathe. HeartGold A sweet aroma gently wafts from the leaf on its head. It is docile and loves to soak up sunrays. SoulSilver Its pleasantly aromatic leaf has the ability to check humidity and temperature. Black It uses the leaf on its head to determine the temperature and humidity. It loves to sunbathe. White It uses the leaf on its head to determine the temperature and humidity. It loves to sunbathe. Black 2 It uses the leaf on its head to determine the temperature and humidity. It loves to sunbathe. White 2 It uses the leaf on its head to determine the temperature and humidity. It loves to sunbathe.